This room boasts vintage Victorian décor with tall windows and 14′ high ceilings. With two brass queen beds and a sitting room, it’s perfect for traveling with a friend or an extra family member. 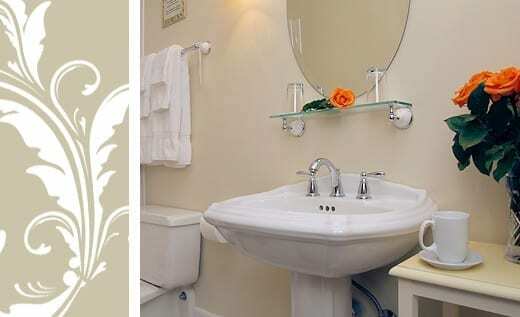 The private bath has a pedestal sink and a conventional tub and shower. Very Comfortable and very quiet… and perfect as a base camp while going on adventures in the area. I am absolutely astounded by this place, it's that good. The owners, (Jenny and Lowell) the reception staff (Zachary), the restaurant servers (Amy and Deborah) are, simply put, as good as it gets. Each and every one of them went WAY out of their way to make sure our stay was a fantastic, over-the-top, memorable one. They made sure everything was just right, for my wife's Birthday, and I assure you, you cannot go wrong.